Located at the center of Naha city and 5 minutes to Kokusai-dori. 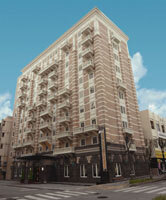 It is very convenient for business, sightseeing and shopping. Guest roos are spacious and width of single bed size is 123 cm and bigger than normal size. 7 minutes by taxi from Naha Airport. 2 minutes walk from monorail Asahibashi Station.